The algae in the Berry Radical is akin to chlorella. We know that one issue with chlorella is because it grows in the sea it is susceptible to contamination with mercury and other heavy metals. I work with folks who are particularly sensitive to the issue of heavy metal accumulation. How do you assure the purity of this algae? Firstly, our growing ponds are in Karratha in Western Australia which is a particularly clean, deep area of ocean. Although the algae is grown in sea water, the water is pumped into special growing ponds which allow the water to be monitored and regulated. Secondly, the dunaliella salina is certified organic which means the water is regularly tested for contamination and heavy metals. The grower and processor regularly conduct independent testing to ensure that the levels of heavy metals (mercury, arsenic, lead etc), organochlorine and pesticides, and microbiological organisms are within acceptable levels. Does the coffee berry or cacao contain caffeine and if so how much? Would you consider the Berry Radical a stimulant in any sense? Interesting research on caffeine in the field of homeopathy indicates caffeine's stimulating effect is when cooked, but not when eaten raw. pulse. Notably, when the same decoction was made with raw, un-roasted cacao beans neither effect was noticeable. A cup of tea contains an average of 40mg of caffeine, compared to 85mg as found in a cup of freshly brewed coffee. A cup of hot chocolate usually contains about 4 or 5 milligrams of caffeine, which is about 1/20 that of a cup of regular coffee. A serving of Berry Radical will contain about as much as in a hot chocolate, but considering the coffee berry and cacao in Berry Radical are raw, we can assume there will be no stimulant effect. I know a few people that can't eat fresh strawberries, will the Berry Radical be different to fresh strawberries due to the way it is formulated? The organic strawberries in Berry Radical are freeze dried to retain all the nutrients found in the fresh fruit. If people have problems with fresh strawberries, they could have problems with Berry Radical. I realise that In-Liven and Berry Radical are two totally different products and it would be most beneficial to use both, but if a customer could only afford to use one of them every month and they were an average person with average health which product should I recommend? In-Liven is a probiotic for intestinal health and helps with the absorbtion of nutrition form the food we eat. 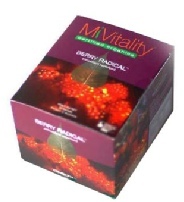 Berry-Radical is an antioxidant that mops up free-radicals, which are the cause of many health problems and ageing. We cannot advise which one should be eaten over preference of the other. That is the individuals choice. I know Berry Radical is a food or juice and we can't give dosage amounts because it is not a pharmaceutical, but what would be a rough guide as to how much children should have (from babies upwards? Cost will probably be the prohibiting factor. I would recommend adding it to a smoothie that is shared amongst the family/children. Is it OK to have Berry Radical mix with In-Liven? A friend of mine is taking In-Liven & Goji juice togetherand it works for her son's eczema much much better than taking either only one of both. Yes, absolutely, Berry Radical and In-Liven can be mixed together. Is it alright to sprinkle Berry Radical onto dried food to eat? Yes, that is fine to do. additives they contain. The chemicals within chocolate are called methylxanthines. They can be further classified as theobromine, caffeine, and theophylline, all of which have deleterious effects on the body. growth, nervousness, depression, anxiety, insomnia, gastrointestinal problems, and itching. Caffeine is highly suspected of being a carcinogen, and is directly linked to heart and circulatory problems, glandular difficulties, nervous disorders, osteoporosis, birthing abnormalities, and so forth. Theophylline causes stomach problems, nausea, vomiting, and nervous disorders. The processing of cacao beans into powder and chocolate is an unsanitary, risky procedure to say the least. To be blunt-chocolate and cacao are laced with animal faeces and hair, insects, and moulds. The carcinogenic mould called aflatoxin has been found in large quantities on cacao beans. The statement that "Chocolate and cacao are outright health hazards due to the chemicals,contaminants, and additives they contain" is unfounded and untrue. Regarding the 'chemicals', theobromine is a mild stimulant - much lesser than caffeine. It can be safely consumed by humans, but cannot be metabolised by some animals, particularly dogs,which is why you shouldn't give dogs chocolate. Regarding the 'contaminants', I'd like to know which ones they are referring to. If they are referring to pesticides, then, naturally, ours contain none, because it's certified organic. What 'additives' are they referring to? I assume they mean the additives that go into making chocolate. Irrelevant for Berry Radical because we're using just the raw cacao bean powder. Regarding 'The processing of cacao beans into powder and chocolate is an unsanitary, risky procedure to say the least.' I can only say that is a ridiculous generalisation, and certainly doesn't apply to our cacao powder! Cacao powder is only one component used to make chocolate. Berry Radical is in no way similar to chocolate and has none of the additives or chemicals that are being referred to. Our cacao beans and nibs are the original heirloom royal criollo cacao from Xoconusco in Mexico. By buying this organic raw chocolate you are supporting a sustainable project that is rescuing this original heirloom variety of cacao, which has been grown by the mayans of Xoconusco since they originally domesticated the cacao tree over 3,000 years ago. The certified organic indigenous growers use an age old system of permaculture, where the cacao trees are planted under the native forest canopy, along with other fruit trees, such as mango, avocado, papaya etc. All of these trees add their distinctive nuances to the fine multi-floral flavor of this exquisite cacao. Our raw cocoa powder and butter comes from Peru where raw Peruvian criollo cacao nibs are cold pressed into anti-oxidant rich cocoa powder and highly sensual cocoa butter. At no stage in the processing of any of our raw cacao products does the temperature go above 45° Celsius (113° Fahrenheit).